One of the keys to a happier, more focused life. Hygge (hu-ga) is a term that I’ve been hearing everywhere over the last year, but it wasn’t until recently where I decided to learn what it is and why it’s becoming so popular in the west. Hygge is a Danish word that translates into cozy. As Denmark repeatedly is in the top 5 for happiest countries in the world, I can’t help but wonder if embracing hygge is part of the reason why they’re so happy. I decided to do a little research into it to see how I can start applying hygge into my everyday life. Good news: it’s so easy to do! After a few stressful months, I’ve decided that I really wanted to lean into the hygge lifestyle a little bit more and see if it could make some stressful days a little easier. I’ve found that I’m not only happier, but less stressed and surprisingly, more focused. The combination of these three results has improved my life immensely. 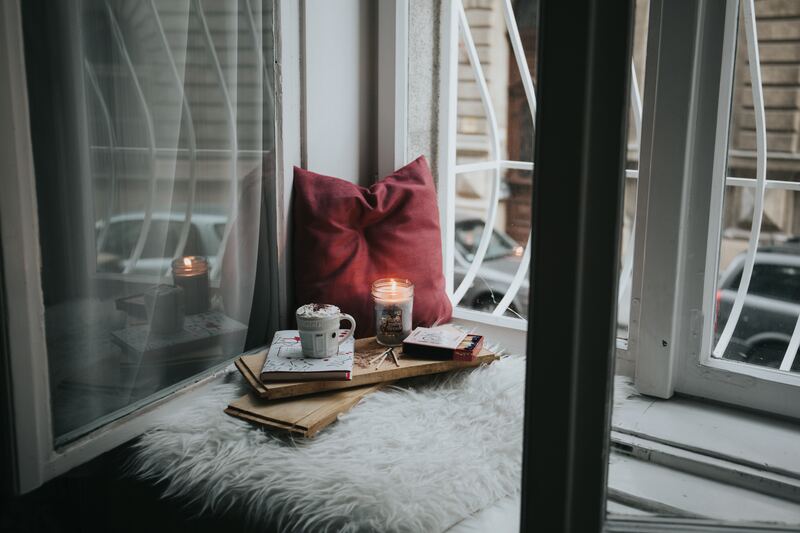 As a woman constantly on the go, I find taking a few minutes or an hour at the end of the day to unwind and get cozy is necessary to keep stress levels low and my mind sharp for the next day. How Does One Incorporate Hygge? Incorporating hygge is actually very simple and can be a little different for everyone. The main point of hygge is to be comfortable and cozy. This can mean lounging around in sweatpants under some blankets and reading a book or eating some delicious pastries in a quaint coffee shop with some friends. For me, it means throwing on sweatpants, lighting candles, turning on the string lights, and snuggling up under some blankets with some tea and catching up on my shows. When I’m traveling, I find getting some tea and reading a book before bed is the perfect routine. It doesn’t have to be all or nothing. Any way you can incorporate hygge, I believe, can help reduce your stress. Hygge Can Make You More Focused? Before I started to incorporate hygge, I was often trying to multi-task and complete as much as possible in the few hours I had between the time I got home from work and going to bed. I thought I was being productive, but in truth, I was being less productive than ever before. Switching between tasks and doing them haphazardly has caused me to spend more time on each task instead of just focusing on what needed to get done. Once I started with hygge, after work I would focus simply on relaxing. I’d change into comfy clothes, make dinner and listen to some soft music for the background noise. Then I’d pour myself a glass of red wine and end the night snuggled under blankets, with some candles lit and would either read my book or watch tv. I tried my best to save my major tasks and chores for the weekend or did them before I got home. Home turned into my sacred place to relax. When I did have a bunch of work that needed to get done during the week, I did it before I got comfy. Everyone knows once the sweatpants come out, the chances of going out are very slim. By focusing on myself, I was able to concentrate on what I wanted to do with my life and make little steps towards those goals. My mind was no longer bogged down by all the chores I had to do or things I had to do for work the next day. Instead, I learned how to simply focus on what I’m doing and what I could control in that moment. Lisa Coleman is the founder of Karma Copywriting LLC. She helps businesses reach their goals through original, creative blog posts and articles. Learn more about how she can help your business by going to www.karmacopywriting.com.